SORRY I DO NOT OFFER FREEBIES ANYMORE! TAKES ONE BAD SEED TO RUIN IT FOR ALL! I am happily married to my fantastic truck driving husband. I am a mother to the greatest son in the world. I do not work so i taught myself how to make many thing's. I am proud of what i make and i stand by what i make. I use everything that is in my booth on a daily basis. I hope you find something that you like when you stop by my booth. Any questions just send me a message and i will be happy to help you. This would not be possible for me to do without the support of my husband and my son. They are my biggest supporters and fans! I love them dearly! 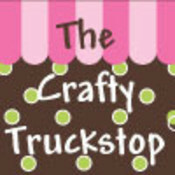 Thecraftytruckstop doesn't have any items in their booth!